Many BAFTA winners will move on to the Oscars on February 24. As ever, the British Academy of Film and Television Arts’ EE British Academy Film Awards favor homegrown fare. As a result, the BAFTAs — whose voters do overlap somewhat with the Academy — are not always predictive. Last year, Martin McDonagh’s “Three Billboards Outside Ebbing, Missouri” dominated, while on Sunday another Fox Searchlight release, Londoner Yorgos Lanthimos’ “The Favourite,” took seven awards, including Leading Actress Olivia Colman, Supporting Actress Rachel Weisz, Original Screenplay, Production and Costume Design, Make Up and Hair, and British Film. But it did not land Film and Director. Those went to Alfonso Cuarón’s “Roma” (Netflix), which picked up a total of four awards, including Film Not in English and Cinematography, which it lost to “Cold War” on Saturday at the ASC Awards. These wins are likely to repeat on Oscar night. “What would Chivo do?” said Cuarón as he accepted the Cinematography award. Just as many people mentioned Brexit at the BAFTAs, a highly charged political issue, in his acceptance speeches, Cuarón made the connection to stateside immigration issues. The BAFTAs give “Roma” and “The Favourite” nice boosts heading into final Oscar voting; ballots open on February 12 and close a week later on the 19th. 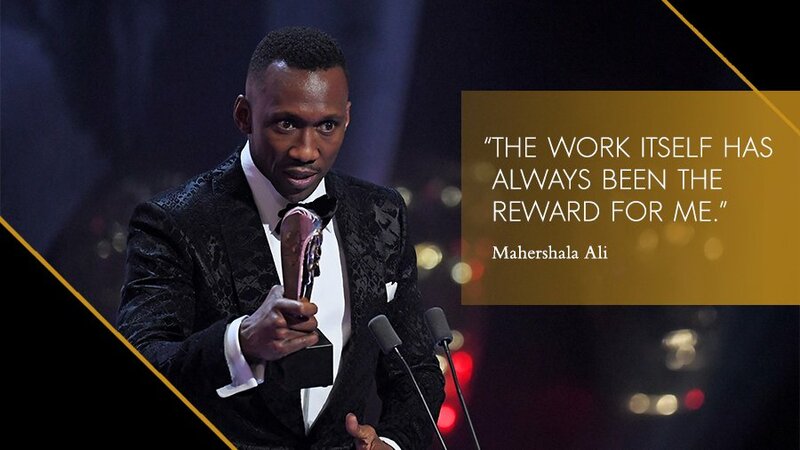 Widely considered to be a frontrunner duking it out with “Roma” in the Best Picture race, “Green Book” took home one award: the inevitable win for Mahershala Ali, who is sweeping the season’s awards and is a lock for a second Oscar statue, which he took home for “Moonlight” two years ago. Best Picture Oscar advantage: “Roma.” When a movie starts to become inevitable, voters tend to go along. Colman gets a nice perk in the Oscar race for Best Actress against Glenn Close (“The Wife”), who many voters will happily give a career prize after seven nominations and no wins. Oscar newcomer Colman has been working on “The Crown” and hasn’t been as available to do the hand-shaking rounds. The race is close — no pun intended. 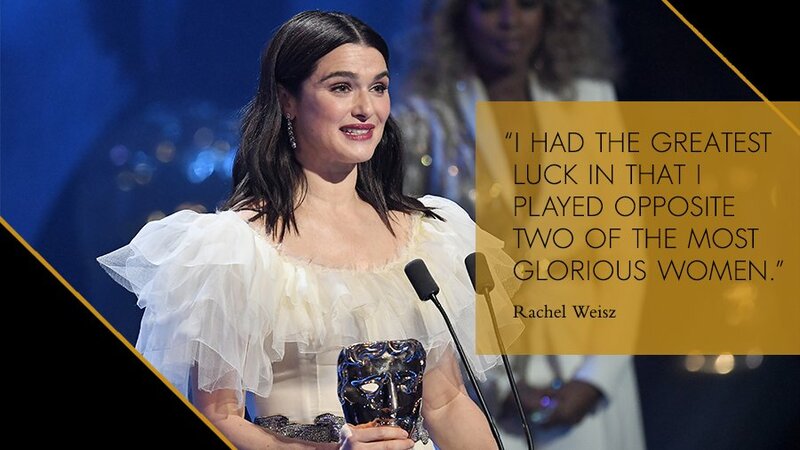 Rachel Weisz at the BAFTAs. 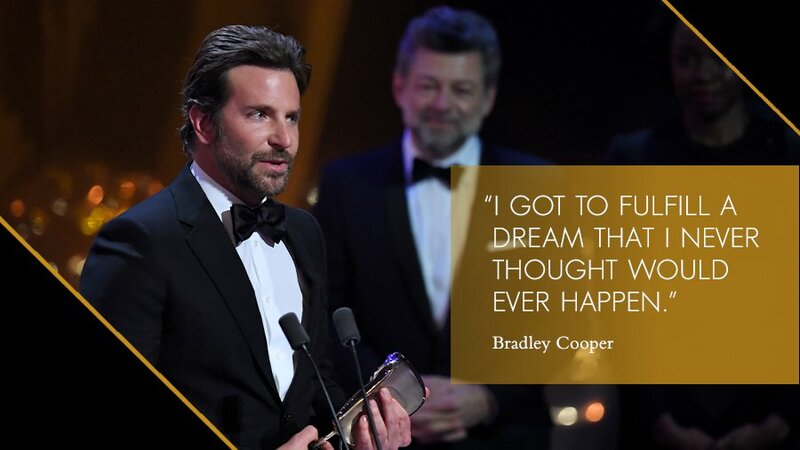 Bradley Cooper at the BAFTAs. Likely to repeat at the Oscars is the Adapted Screenplay award for Spike Lee’s “BlacKkKlansman,” which marks the only competition for Cuarón for Best Director. Also sailing into the Oscars with a strong wind behind it is BAFTA-winner “Spider-Man: Into the Spider-Verse,” which can’t be beat for the animation prize, and “Free Solo” gets another lift for its Best Documentary duel against “RBG” in the Oscar race. The EE British Academy Film Awards unfolded on Sunday February 10 at the Royal Albert Hall, London. The ceremony was hosted by returning Joanna Lumley, and was broadcast exclusively on BBC One and BBC One HD as well as major territories around the world.